To automatically switch from a weak or unstable Wi-Fi network to the Verizon Wireless cellular network to preserve a consistent data connection, view this info. When enabled, this advanced setting allows the device to switch from a weak or unstable Wi-Fi network to the Verizon Wireless cellular network to preserve consistent data throughput. This function is not enabled by default; the device prompts the user to enable the feature the first time they experience poor Wi-Fi connectivity . When connected to the Verizon Wireless cellular network, data overage charges may apply (depending upon data plan). For data usage information, refer to the My Verizon website. Slide down the Notification Bar and select Your Internet connection is unstable. If presented with the "The Internet connection via this Wi-Fi network is unstable" pop-up, select OK. 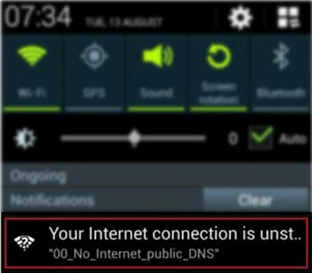 When the Wi-Fi connection is unstable, selecting OK activates this feature and the device automatically switches to the mobile network. 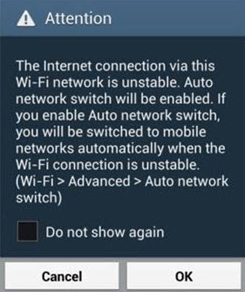 If preferred, select Do not show again before selecting OK to prevent the unstable Wi-Fi connection prompt. Select Menu (located in the lower left). Select Auto network switch to enable or disable. If presented with the "Mobile data may be used to maintain a stable Internet connection. This may increase data usage" prompt, select OK to continue.